Background: Oscar’s is a Mexican restaurant that can be found in Downtown Redlands, CA. If you’re not familiar with this area, there is a popular market night every Thursday. It consists of locals selling produce, knickknacks, and other homemade goods. Oh…and there are plenty of food vendors. Anyways, apart from Thursday nights,the street where market night is held on is a street that has an “old town” feel. It’s covered by brick buildings and trees and is a pleasant place to walk around and window shop. This is where Oscar’s can be found. 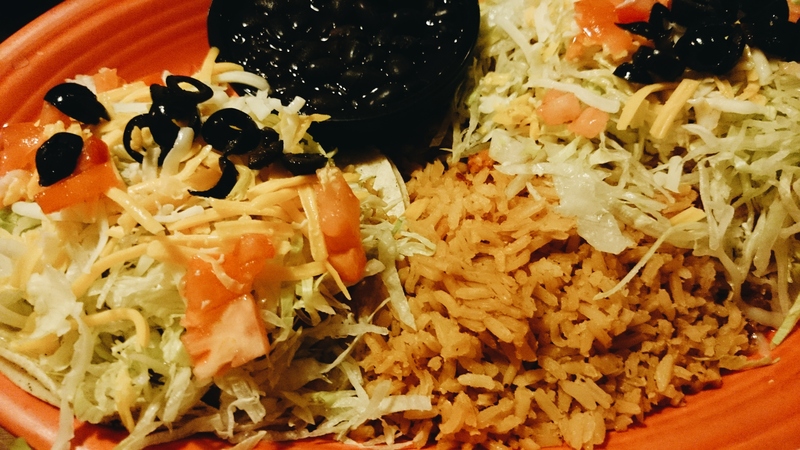 The meal in the picture is of a vegetarian taco and enchilada plate with your standard rice and black beans. If you frequent Mexican restaurants and know the difference between an “authentic” Mexican restaurant and an “American” Mexican restaurant, then I would say Oscar’s is of the latter. Not to take away from the taste, because the food is delicious, but it is not of the “authentic” type. I hope my last paragraph made any kind of sense. Who am I to say what’s “authentic” and what’s not, but it’s the best way I can describe this restaurant because…who doesn’t know what a taco and enchilada taste like?!?! HAHA! (if you don’t my sincere apologies). Anyways it is a nice restaurant with a hole-in-the-wall vibe with tasty food. Most places have vegetarian options, but I wanted to point this out because Redlands is the neighbor city of Loma Linda, which is a vegetarian city. Visit, try, and enjoy the scene of Downtown Redlands. Although, don’t make a day out of it. The area is quite small.